With the chicken breast on a cutting board, place your hand flat on the piece of meat to hold in place. With a large, sharp knife begin cutting the piece of meat in half, slicing parallel to the surface of the cutting board. Be careful to stay clear of the hand placed on top of the meat and cut all the way through filleting the chicken breast in half. Between two sheets of wax paper pond the meat until thin and even. Beat one grass fed egg in a bowl and set it aside. Lay the mixture out on a flat dish. Dredge the chicken in the egg the coat each side with the crumb mixture. In a frying pan add 2 tsp of organic olive oil and bring the pan to medium heat. 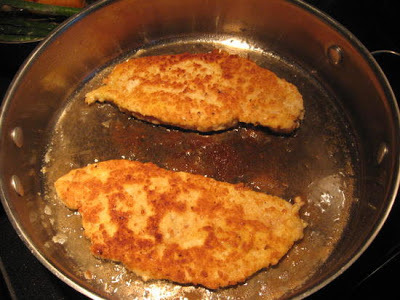 Fry the battered cutlets for 3 minutes on each side.